View of The Queen's College facing on to Oxford High Street. It was founded in 1340 by Robert of Eglesfield, who named it after Edward III's queen, Philippa, in the hope that future queens would endow the College. It was successful in this respect. Daniel Defoe commented in the 1720s that "[the college] is presently encreased by several royal benefactors". At the time of this print the College had just replaced its 14th-century buildings with new ones in the classical style. 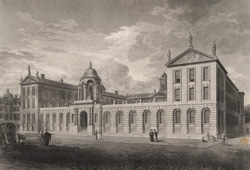 Defoe continued: "It is lately rebuilt, the old building being wholly taken down and the new being all of free stone, containing two noble squares with piazzas, supported by fine pillars; the great hall, the library, and a fine chapel, all contained in the same building, so that it is without comparison the most beautiful college in the university."